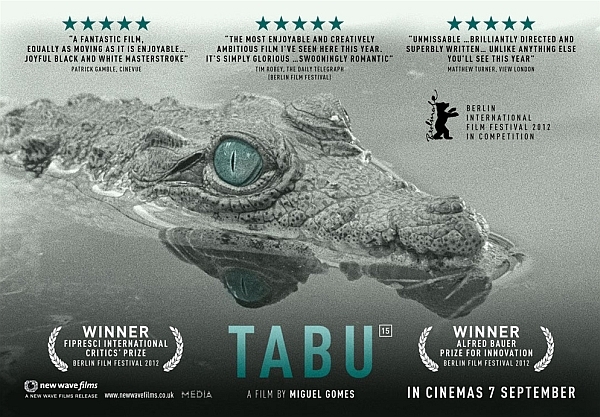 Easily one of the strongest films on display at this year’s icy Berlin Film Festival and a firm contender for best feature of 2012 so far, Portuguese director Miguel Gomes (perhaps best-known on these shores for his previous film, 2008’s This Dear Month of August) returns triumphantly with Tabu (2012). A beguiling black and white drama that spans both decades and continents, this is mesmeric, conscientious filmmaking at its most ambitious and expansive. Knowingly named after German expressionist F. W. Murnau’s Bora Bora-based classic Tabu (1931), Gomes’ acclaimed third feature film divides its time between two complementary storylines – one set in Lisbon, the other set out in the wilds of Africa. Residing in a Lisbon tower block, the eccentric Aurora (played by both Laura Soveral and Ana Moreira) lives out her twilight years with her trusted African maid Santa (Isabel Cardoso) perpetually at her side, haunting memories of the past seemingly hanging on the other. When Aurora is admitted to hospital, kindly next-door neighbour Miss Pilar (Teresa Madruga) takes it upon herself to uncover the melancholies that have blighted our protagonist’s later life. Pilar uncovers a long-lost love affair between Aurora and a mysterious Italian suitor, whom she courted beneath the shadows of Mount Tabu in Africa. Gomes creates a clear distinction between the two time frames with exemplary use of both 35mm and 16mm film – with the results simply sumptuous. Whilst Gomes’ Tabu is by no means a mere pastiche, one can’t help but but be taken with this unashamedly nostalgic slice of arthouse cinema. Murnau comparisons are no mere hyperbole, and whilst Michel Hazanavicius’ Oscar-winning The Artist (2011) paid homage to the kings and queens of Hollywood’s silent era, Gomes here lauds a number of past European masters – whilst putting forward a very strong case for his own future inclusion. The colonialist allure of Africa – a continent so rarely muted in monochrome, yet so eternally vivid and vibrant all the same – calls not only to the fading Aurora but also directly to the film’s audience. There is almost a sense that Henry Morton Stanley could appear at any time, uttering the immortal line: “Dr. Livingstone, I presume?” – an Africa of cinematic myth, rather than fact. Utilising its different stocks and locations to devastating effect, Gomes creates that rare thing – an experimental arthouse effort with (in its narrative at least) genuine mainstream appeal. Sadly, there seems little danger of Tabu troubling some of the week’s larger releases, but the touch paper of fervent critical acclaim has already been lit. Say hello to your new favourite auteur. To read our review with Tabu director Miguel Gomes, simply follow this link.